Whether you are looking to teach students about dependent origination or explaining the Eightfold Path our resources cover a range of themes that are found within most A Level and GCSE syllabuses. They include presentations, lesson plans and quizzes. The resources are divided into three groups: Buddhist doctrines and practices, karma and life and death. Within these groups there are unique and detailed plans and activities that students can engage with. The Introduction to Buddhism resources are ideal for presenting Buddhism to students for the first time. The presentation covers a wide range of topics including the origins of Buddhism, the life of the Buddha, the Four Noble Truths and the monastic community. The lesson plans expand upon the presentation and look in more detail at key parts of Buddhist doctrine and practice. Revise or recap previous lessons by using the quiz. The presentation looks at the renouncer tradition of ancient India, monastic codes and the ordination process. 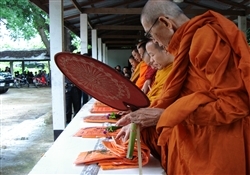 Different schools of Buddhism are explored and the Theravada ceremony is explained in detail. This presentation shows students the interior of a Thai temple and what takes place in temples. Fully adaptable, the presentation has colourful and vibrant photos that bring the study of temples to life. The lesson plans introduce samsara as a cycle of life, death and rebirth. Students will look at how rebirth can vary from lifetime to lifetime and be able think critically about why samsara is viewed as being undesirable. They also explore the nature of existence within Buddhist thought. Students will be able to identify dis-ease, impermanence and not-Self. These resources introduce the Buddhist teaching of karma and the early origins of the term. The lesson plan also looks at the link between karma and rebirth. The resources explore merit and the role it plays in the daily lives of Buddhists. The Merit Presentation explains in detail the relationship between merit and karma, the three bases of merit, and the giving of merit. The short merit presentation contains a more concise explanation of merit. The resources focus on generosity as a way of generating merit. Generosity applies this to both the lay and monastic communities and the materials demonstrate how both parts of the community support each other. The resources look at ethical conduct and how it viewed in regards to the Eightfold Path and generating merit. The role of ethical conduct for the lay and monastic communities is also explored. The resources explore how the lay and monastic communities can generate merit by cultivating religious and positive states of mind. The materials look at devotional practices. The resources explore Dependent Origination and how it interacts with karma, samsara and Buddhist ideas about causality. The resources focus on the processes involved with death according to Buddhist thought. This covers teachings from a number of Buddhist schools including Theravada and Tibetan Buddhism. The resources looks at ghosts and lower forms of rebirth within Buddhist cosmology. The resources can be used alongside the film Caring for the Beyond. 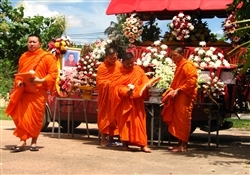 It looks at two festivals for the dead that form part of modern Buddhist practice within Laos. This resources can be used alongside the film The Spirits' Happy Days. The film and presentation provide an insight into the ghost month rituals that take place in Buddhist temples in Fujian, China. This resource looks at how Buddhism can be found within Asian Horror films. Using Spirited Away, Nang Nak and The Coffin, students can see modern interpretations of Buddhist teachings, especially those concerning ghosts and spirits.